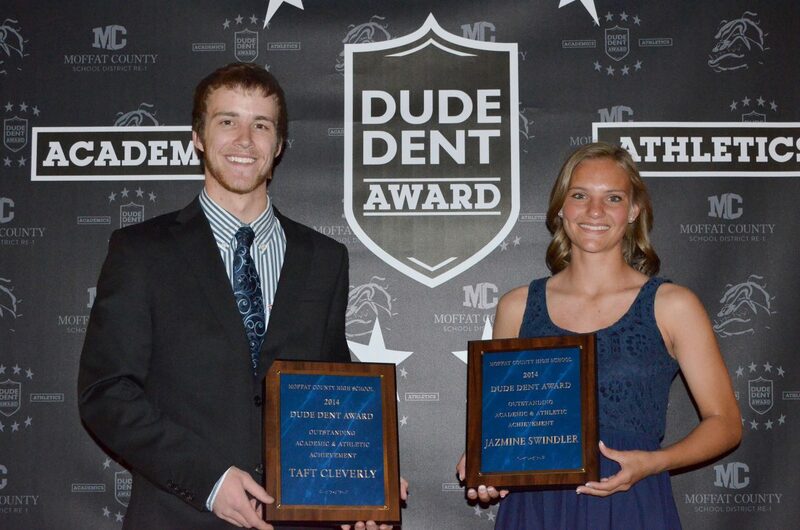 Taft Cleverly and Jazmine Swindler were the 2014 recipients of the Dude Dent Award for outstanding athletic and academic achievement. The seniors are excellent students and leaders and were instrumental in the success of MCHS teams throughout the past few years. Craig — With competitive teams in every sport, being a captain, leader or star on any Moffat County team is an accomplishment on its own. Being a high-achieving student for four years is something worth celebrating, as well. Families, coaches, administrators and fellow athletes gathered at the Clarion Inn & Suites on Wednesday night to honor students who have excelled in both aspects with the Dude Dent Award for outstanding athletic and academic achievement. Six student-athletes’ careers were celebrated for outstanding performance on the field of play as well as commitment in the classroom and community. Jazmine Swindler was the female award winner and Taft Cleverly was the male winner — two seniors who were key members on successful teams and showed character off the court. Swindler will graduate with nine varsity letters between volleyball, basketball and soccer and has brought her brand of hustle to each team each year. Swindler thanked her family, coaches, teammates and friends for their support during her four years in high school and added that teachers are also important in a student-athlete’s life, helping students stay up to date despite all the traveling they do. Cleverly took over as point guard of the MCHS boys basketball team after a 2-20 season and was instrumental in the team’s turnaround to a Great 8 appearance this year. Much of that improvement came because of Cleverly’s leadership, his coach said. Cleverly thanked his family, coaches and teammates, as well, making mention of his fellow nominees, Jesse DeMoor and Sheldon Greenwood. Four other finalists for the award also were celebrated Wednesday. Along with DeMoor and Greenwood on the boys side, Brenna Ciesco and Kelly Knez were nominees for the girls award. Ciesco was an all-state performer in cross country and has been a fixture in the midfield for the girls soccer team, including as captain the past two seasons. Knez has run cross country and track each fall and spring for the past four years. She also played basketball in the winter her first three years of high school before joining the girls swimming team her senior year. Cross country and track coach Todd Trapp sampled some fellow students’ opinions of her when he spoke. DeMoor was a leader of the wrestling team and took third in the state his senior season, a culmination of the dedication he has displayed throughout his athletic career. That dedication was clear to coach Tanner Linsacum even during his first season as MCHS’s coach. “That attributes that I would want in a wrestler, I have four of them — work ethic, determination, coachability and the will to win,” Linsacum said. “That is the epitome of Jesse DeMoor. Greenwood was a captain on the football and baseball teams this year and has been a steadying force for his younger teammates on both squads. That comes from a commitment that began back in grade school, coach Kip Hafey said. “He’s committed, he’s selfless and he’s got a work ethic like no other,” he said.